A CD featuring Song of thanksgiving, written collaboratively with her husband, poet Phil Andrews McGovern has been released on Future Music Records. Nicola (née Ellis) was born in 1964 in Wrecsam, North Wales. She began to play the recorder and piano from an early age and was greatly encouraged by her piano-playing father. Later Nicola took up the flute/piccolo and was a member of the National Youth Orchestra of Wales. She was awarded a First for her final degree recital at Manchester University and has since given many solo recitals featuring contemporary, jazz and world music styles. Several composers have written pieces especially for her and she has also played with various contemporary music ensembles. Nicola started to compose non-stylistically aged 20 during her final Mus B year at university. She then completed a Masters degree in composition at King's College London University followed by the performance communication skills course at the Guildhall School of Music and Drama. 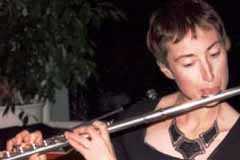 Nicola was a winner in the Cardew Composition Prize 1991 and received special mention in the 1990 competition. Under the auspices of the Society for the Promotion of New Music her music has been played by the Bingham String Quartet (Chard Festival of Women in Music 1990) and at the 1994 Huddersfield Contemporary Music Festival. The latter was as part of the Composers' Choreographed project when the Siobhan Davies Dance Company performed to her Beauty of innuendoes which was played live. Subsequently a radio feature on this event was broadcast on Radio 3's Night Waves. Other performances of Nicola's music have been given at the Purcell Room (South Bank Centre), at the Barbican Centre foyer in London and in Israel by such ensembles as Gemini, the Scottish Chamber Orchestra String Quartet and the Langdon Chamber Players. A CD featuring Song of thanksgiving for every second I am alive, written collaboratively with her husband, poet Phil Andrews has been released on Future Music Records. She has been commissioned by the Portsmouth New Music Orchestra, the Cambridge New Music Players, Concordia, Flute House Trio, the Mercia Ensemble and also by a poet and a film-maker. A commitment to music education has led to Nicola becoming a Head of Music at St Paul's Catholic School, Milton Keynes. As a music/cross-arts workshop leader she has worked with client groups of all ages and abilities eg people with physical disabilities, sensory impairments, learning difficulties and mental health problems. Nicola has worked with practitioners from other disciplines eg dance, drama and visual art. As a Christian, Nicola's faith is reflected in her work. She has performed at church benefits and evangelistic events. Nicola and her husband have been involved in devising worship music for various events. They are currently helping to plant New Life Church Milton Keynes South in association with Newfrontiers. Song of thanksgiving for every second I am alive on New British Music volume 1, FMR Avant CD 35 - 0996 (Future Music Records) at 10 Baddow Road, Chelmsford, Essex CM2 0DG on 01245 353 878. Most of the works mentioned in the list of selected works are available on tape but are not yet commercially recorded. Contact Nicola for copies if you are interested in any of them. Return to British Composers main index or take a look at MUSICNOW main page to see what's new.